About the room: 1. 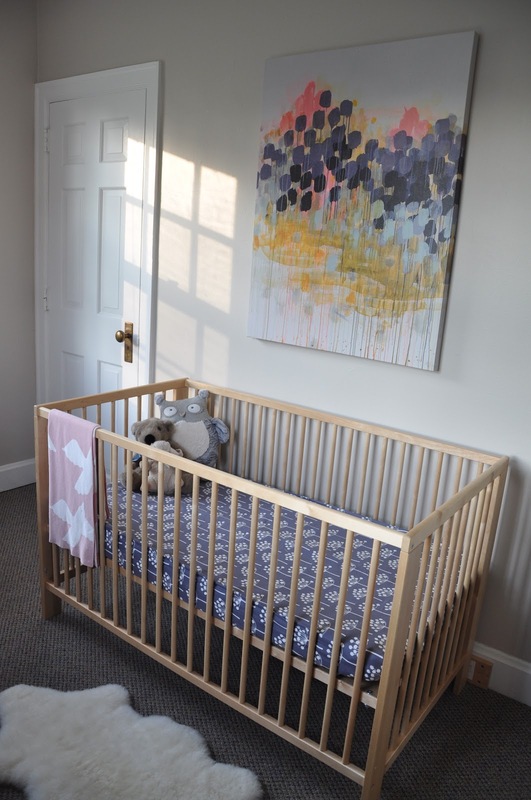 It's a nursery on a budget! Our job was made a little easier with the room being so small. 2. One thing that was really important to us was purchasing our bigger items with the vision of moving them to other parts of our house some day down the road. That is, our bigger purchases weren't very "baby" so as to be long term investments. I also wanted to create a room that we would want to be in (not just baby girl)......this was simply put "more us". 3. You may notice there are no curtains......that's because we are moving within the year (more permanently). I actually prefer no curtains here because it would be overwhelming for this small space......plus there is character in the old windows. For all you concerned moms, we will figure some other way for darkening the room during naps. This is so great!!!! I love it and is very you. I hope you know that you will be solicited for help in decorating our baby room someday! I LOVE IT!! I particularly love the birdies on the wall!! Such a stylish look for a nursery. You will love being in there! Oh my goodness, Heather. I can't believe that's the same room we saw in February! I mean, that's where we took our snow boots off, right? You've done an amazing job of turning that room into a beautiful nursery. I love it!! SO sweet! 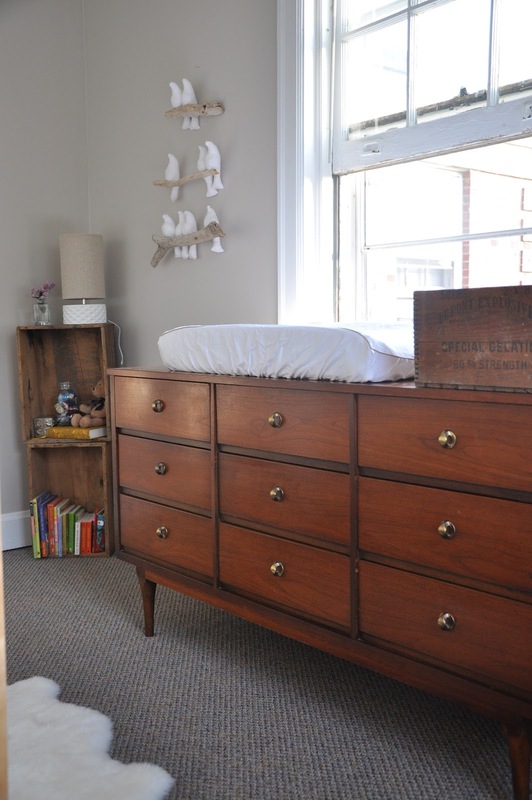 I love the dresser doubling as a changing table. And the windows are lovely. Well done! Thank you so much everyone for all the kind words! And Susan- yes, the same room.....it was fun to make something pretty out of a our little junk room:). This is beautiful and peaceful! Could you tell me where you found the bedsheet, please? Ps. 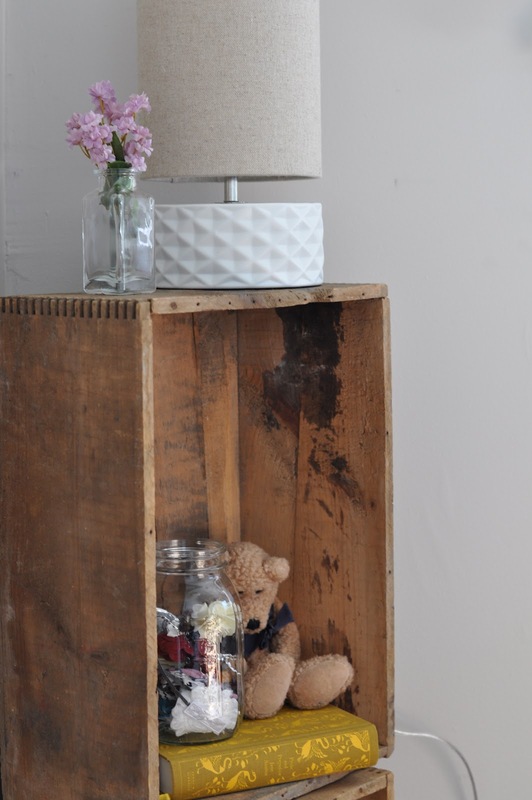 There's an awesome mid-century giveaway today....check it out! Thank you Coryann, just checked out your site and I love your baby mobile! 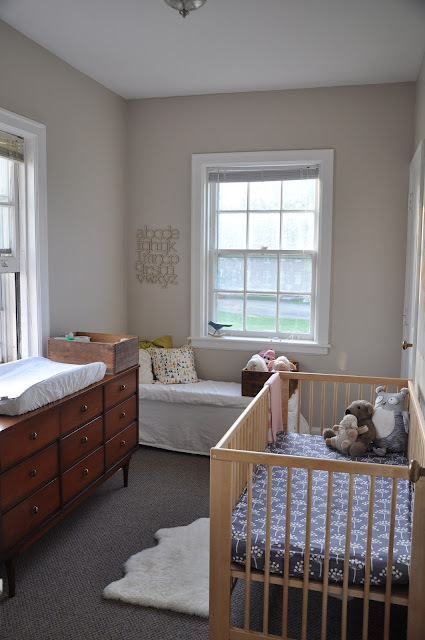 I absolutely love everything about the nursery. Can you tell us what paint color you used? Thank you! Hi heather, I just called sherwin Williams to ask if they carry manual barracks and they do not! Could it have been a different brand? Painter is coming tomorrow...help! Thanks! Caroline, You could call the Sherwin Williams in Watertown, NY and they should have it on file to give to your local store. Hope that helps, and good luck! Hi heather, I am so sorry to keep bothering you! I just called the Watertown ny store and the gentleman who answered said it must be a custom color. I know this is asking a lot of you, but would you call them and give them your name so he can look up the color (assuming you have an account there)? I will then call him back and see if he can give me the info on the color for my local store. Their number is 315-788-3130. If you can't, I will do my best to find a similar color but I'm worried it will be too brown or grey! Or if you have another suggestion for a neutral color off the top of your head I would lovento hear it. Your taste is impeccable! Caroline (and anyone else interested)- the Sherwin-Williams Modern Gray is very similar. We just used that in our new house. Hope that helps! Where did you get the painting? Katie, the painting is by the talented Caroline Wright! You can also see her other work on her website:).